Unique & Fashion Design,Classic Analog Style.Genuine Leather Strap. Best Accessories for Casual Clothing,Business clothing. 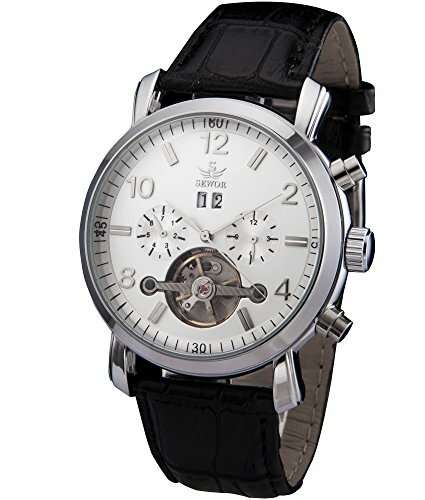 These gentlemen mechanical wristwatch \"SEWOR\" is a Good Choice for a Birthday, Christmas, Wedding or Best friend\'s Gift. A package includes: 1x Watch , 1x SEWOR Giftbox ,1x SEWOR Hanging tablets.Dimensions: 40 mm, Thickness: 1.2 mm. 100% New Condition With Excellent Workmanship, Precise mechanical movement. No need to use battery, Wind up the crown by clockwise about 15-20 arounds, Tightening a walk for 24 hours. Please wind up the watch before every usage and keep away from magnet to avoid making it stop working.